Samsung is the latest company to get into the tablet business. This, despite the fact that the tablet business is going nowhere, fast. Well, unless your name is Apple and you consider the iPad a tablet. In any event, behold! 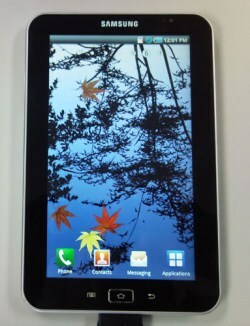 It’s the Samsung Galaxy Tab NX100, and it will makes its official debut at European trade show IFA in September. The Tab will also have an interchangeable camera as will offer some sort of mobile TV capabilities. I’m hesitant to make too much of the TV feature because that type of thing ends up being different in every single country the device is available in. Be that as it may, we can all rest easy knowing that Samsung has a fancy new tablet en route. ProTip: Tablets will just sorta be “there” until someone like HP, now with WebOS, or Google gets into the game.